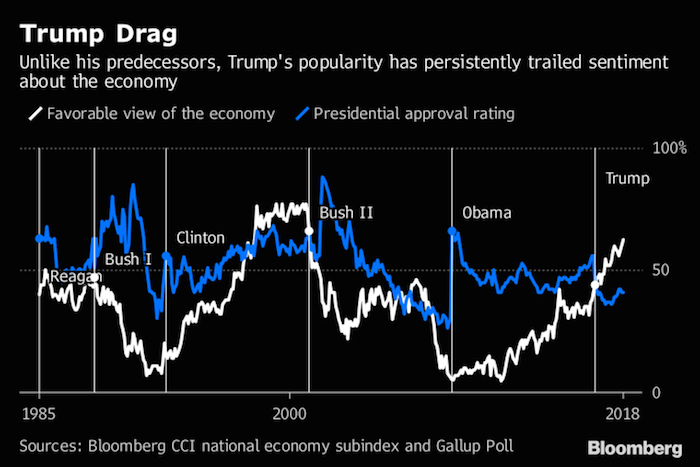 President Donald Trump’s unpopularity is unprecedented given the strength of the economy. That’s according to a Bloomberg analysis of polling data. 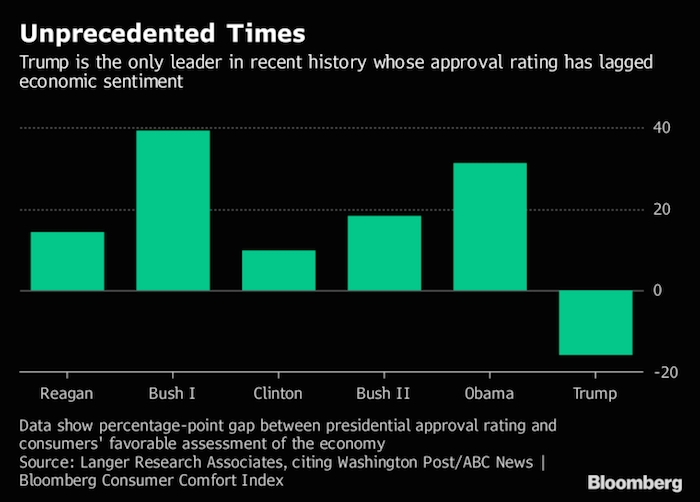 It shows that Trump is the first U.S. leader dating back to at least Ronald Reagan whose approval rating is consistently low and lagging consumers’ favorable assessment of the economy. That’s a big problem for Republicans as they try to maintain control of Congress. White House Budget Director Mick Mulvaney acknowledged as much last week, telling Republican backers in a private meeting that they needed to get voters to focus on the economy and not on Trump in November, according to the New York Times. There’s little doubt that the economy is on a roll — though it’s not doing quite as well as the president maintained in a hyperbolic tweet on Monday suggesting its performance may be the best ever. Gross domestic product expanded at its fastest clip in four years in the second quarter. Unemployment is a near the lowest since the 1960s and wages look to be finally on the rise. “The economy booms, but President Donald Trump’s numbers are a bust,” said Quinnipiac University pollster Tim Malloy. The result of all the ramped-up rhetoric in the nation’s capital: Republicans and Democrats are as divided as they’ve been for 14 years when it comes to their overall assessment of how they’re doing. 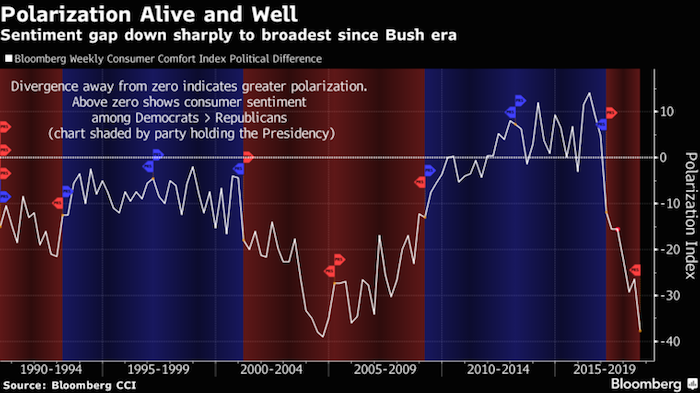 A polarization index, which measures the difference in sentiment between supporters of the two parties in the Consumer Comfort poll, shows the gap widening rapidly since Trump took office in January 2017. It’s now approaching levels last seen in 2004 during the height of the war in Iraq. 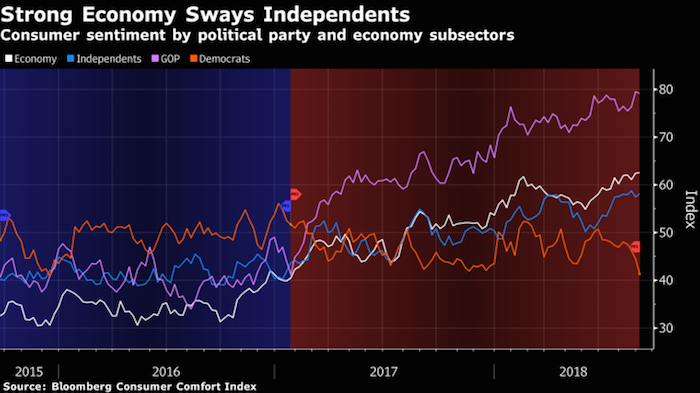 One bright spot for Trump and the Republicans does shine through in the Bloomberg Consumer Comfort survey. Unlike Democrats, political independents have grown more optimistic as the economy has forged ahead. Two caveats, however: Independents are not nearly as upbeat as Republicans are and a clear majority of them still disapprove of the president’s overall performance, according to the latest Washington Post-ABC News poll. Clearly, “a strong economy does not guarantee a popular presidency,” said Gary Langer of New York-based Langer Research Associates. Next: Who really creates value in an economy? The billionaires, or us?